This evocative book plumbs the depths of this ancient Japanese earthen cookware (which dates back to the eighth century), celebrating the joy of communal dining as well as the vessel itself. With gorgeous full-color photographs, the book takes readers on a journey to the remote mountainous province of Iga, where donabe were created and are still produced today. The recipes range from simple (smoked miso-marinated tofu, braised spicy kabocha) to complex (braised shio-koji beef brisket with sunchokes, radishes, celery, and coffee). All exhibit the clean, balanced flavors that Japanese cuisine is known for, with an emphasis on authentic ingredients, such as yuzu, shiso leaf, and salt-pickled cherry blossoms. Many of the recipes are ambitious in scope, and ingredient lists tend to be long, but headnotes offer a roadmap for completing the dish, and a glossary in the back further illuminates unusual components. 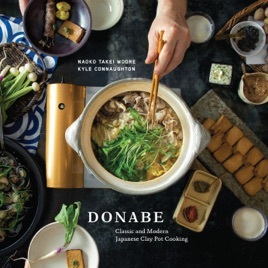 Each chapter highlights a different cooking method, showcasing the donabe's great one-pot versatility and use for braising, steaming, and smoking. The book beautifully explains ichigoichie as "every moment is a once-in-a-lifetime treasure." Readers who adopt the donabe style of cooking, a thoughtful, earth-to-table approach, may feel the same sentiment about dinner.